An SAP® Business All-in-One solution can help you improve financial management, maintain operational excellence, and enhance competitive agility – so you can manage well in times of economic uncertainty and lay a solid foundation for growth. This comprehensive and flexible business management software with built-in support for business best practices is designed specifically for midsize companies looking for an integrated, industry-specific solution to support processes across the entire organization. Enterprise resource planning (ERP) – Effectively manage all aspects of your operations. The software includes comprehensive functionality for accounting and financials, sales and service, procurement and logistics inventory management, human capital management, product development and manufacturing, corporate services, and reporting and analytics. Customer relationship management (CRM) – Effectively manage all aspects of your customer relationships, from generating leads to closing a deal, including follow-up support and add-on sales. SAP Business All-in-One includes comprehensive functionality for marketing, sales, service, contact center, and reporting. Business intelligence – Gain insight and improve decision making with tools for financial and operational reporting and analysis. SAP Business All-in-One offers best-practice reports, analytics, and tools to help satisfy the rigorous reporting requirements for financial accounting, logistics, customer relationship management, and more – all preconfigured by business role and business scenario. Best practices – Benefit from the SAP Best Practices family of packages, which provides proven methods and tools for organizations to implement best business practices in key functional areas and in a range of industries. With industry-specific configuration, SAP Best Practices is based on 35 years of experience in more than 25 industries worldwide. The result is rapid yet reliable solution deployment, which translates into less time, lower costs, and reduced project risk. SAP NetWeaver® technology platform – Because SAP Business All-in-One is powered by the SAP NetWeaver technology platform, you can quickly and cost-effectively add on to your existing solution as your business grows and your needs change. Industry-specific functionality – Solve your business challenges with a solution tailored to your specific industry. SAP partners deliver value-added solutions and services that address your industry’s specific requirements. All the functionality in SAP Business All-in-One is integrated to simplify your business and IT landscape across functions, regions, and teams. It supports streamlined business processes and enables you to complete a process from beginning to end. You might, for example, create an opportunity using CRM, convert it directly into a quote, and then later convert it into a sales order – complete with product, pricing, billing, and delivery – using ERP functionality. Business intelligence functionalities give you real-time visibility into your sales performance throughout the entire process. You also benefit from increased visibility. Centralized data and business intelligence help ensure that there is a “single version of the truth,” providing a 360-degree view of your operations, employees, and customers. All functionality in SAP Business All-in-One is preconfigured for midsize companies and can reside on a single server. This helps ensure fast implementation and reduces deployment cost. Other advantages of using SAP Business All-in-One include fast adoption, increased productivity, and fewer errors. For example, the integrated software and common desktop environment help your employees quickly understand and use the software. Eliminating manual data reentry between different functional areas also saves time and reduces the risk of errors. User-friendly design – Intuitive Web-like features, online tutorials, contextual help, and guided procedures help accelerate adoption and reduce the need for formal training. Automated workflows – Automating manual processes saves time and money. You can, for example, generate an automatic alert on all contracts that are up for renewal or on customers with overdue payments. You can also escalate service requests for your most important customers and automatically route tasks between groups and departments. Intuitive navigation – Role-based navigation, screen personalization, quick links to key data, snapshots of recent records, key reminders and alerts, and an advanced search help users perform daily tasks more efficiently. Groupware integration – Integration with desktop tools such as IBM Lotus Notes and Microsoft Office allows users to manage their activities and communications more effectively – any time, any place. Users can synchronize tasks, appointments, and e-mails and export customer and opportunity lists to Microsoft Excel for analysis. With SAP Business All-in-One, you can have complete confidence in your investment. SAP Business All-in-One solutions, whether delivered from SAP or one of its partners, are configured to match your business requirements without customization. Solutions can be extended to meet your specific needs, whether you are engaged in cross-country, cross-currency, or cross-border trade. You can incorporate additional functionalities to cover, for example, new business processes, different trade patterns, new products, and new users, when needed. 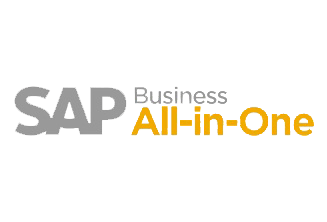 SAP Business All-in-One works with hardware options from various partners and with software options that incorporate the SAP MaxDB™ database and SUSE Linux operating system, reducing your total cost of ownership (TCO). With these pretested, preconfigured options, you can eliminate the guesswork and implement an affordable solution for your company. Because SAP Business All-in-One solutions are powered by the SAP NetWeaver technology platform, you can unify and integrate both SAP and non-SAP software. You can therefore be confident that your IT infrastructure will meet existing needs and future requirements. Today more than 13,000 small and midsize customers in more than 50 countries run SAP Business All-in-One. You can rest assured that SAP, as one of the world’s leading providers of business software, will be around for a long time to come. More than 1,000 SAP partners around the world deliver local implementation and customization support for SAP Business All-in-One, giving you access to expert assistance no matter where you are located. You can buy qualified SAP Business All-in-One partner solutions and industry-specific solutions through the worldwide SAP network of more than 1,000 authorized partners. These partners combine their business knowledge and IT expertise to help you purchase, implement, and support SAP Business All-in-One. Additionally, the SAP Business All-in-One fast-start program offers a simplified process to scope and implement SAP Business All-in-One solutions for manufacturing, wholesale distribution, and service companies. Complete with preconfigured, pretested software and hardware as well as options for lower licensing, installation, and operating costs, the fast-start program reduces implementation time and TCO.